My dear friend, “Are you having a good day?” I surely hope you are and if not, I kindly ask you to definitely read further. Yesterday for the most part, the day was running me rather than me having a good day. Things were happening not necessarily the way I would love them to: I was tired after trekking and not having a proper sleep in a tent. Yet, yet, yet…, regardless of my perception of the reality unfolding, I was aware that it was life happening to me. It does happen every moment whether we are busy planning tomorrow or reminiscing about the past – and as a result completely missing out on the present, i.e. life itself. Anyway, my mind wasn’t at peace yesterday. Then I had to physically run up the hill to avoid getting drenched in a rain. I reached one of my favourite chai shops on the way and landed there at a table with an Indian lady and an Indian guy. The usual conversation of where you are from, etc followed. The lady said she wanted to do a Tushita course on Buddhism – naturally, it drew my attention, and I was glad to share some bits of information with her. It was a very calm flowing chat, with none of us getting excited about the coincidences or common interests that we were discovering among us. Then the rain stopped, and it was time to make a beeline to my place before it resumed. As we all stood up for goodbyes, the lady was so warm that she opened up her arms ready to embrace me in a hug and even gave me a kiss on a cheek! Now, those who are not familiar with Indian culture, probably don’t understand what all the fuss is about. Yet those who have been to India know that hugging (not to mention kissing) does not happen in public among friends, let alone strangers. I was happy to fully embrace her hug and could not help but utter, “Wow! Indians usually don’t do that!” And her response was that she normally didn’t do it either. It was the special connection that she felt between us that made her do that. I was grinning from ear to ear by that time. So I left the chai shop feeling absolutely blissed and recharged with no traces of previous tiredness. 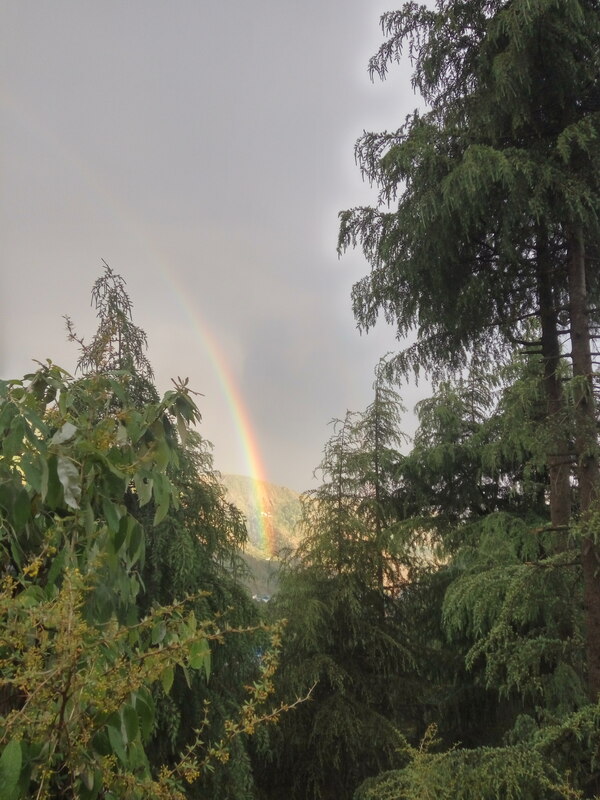 As we walking with the Indian guy along that quiet path, a rainbow appeared in the sky, then it became a double rainbow in all its glory and colourfulness. 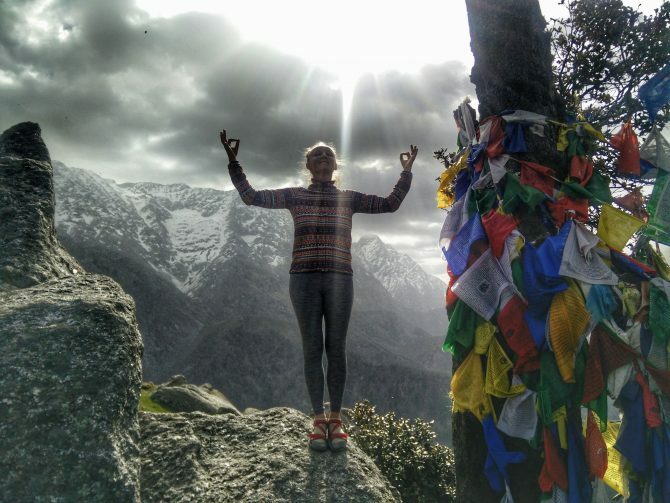 At this point I was almost gasping for air – because of immense gratitude of how blissful I was feeling. A random encounter with beautiful souls completely changed my day from an O.K. to a super dear to heart one. Granted, Dharamshala is such a place that draws many seeking souls, and it is easy to discover beauty in everyday routine. However, I believe it is possible to remain open and perceptive to the magic of everyday life wherever I am. At least, I will be trying to do that. I would also like to humbly recommend the same to you, my dear reader. Stay open even if it is not your best day , be aware and allow magic to enter your life. Allow yourself to feel alive. Feel life happening in and around you. ← Previous Post: Kyrgyzstan. Kirghizia. Back to the Future / Back to the USSR. … И настроение улучшилось. Или кто те люди, которые шагают по городу с улыбкой на лице?